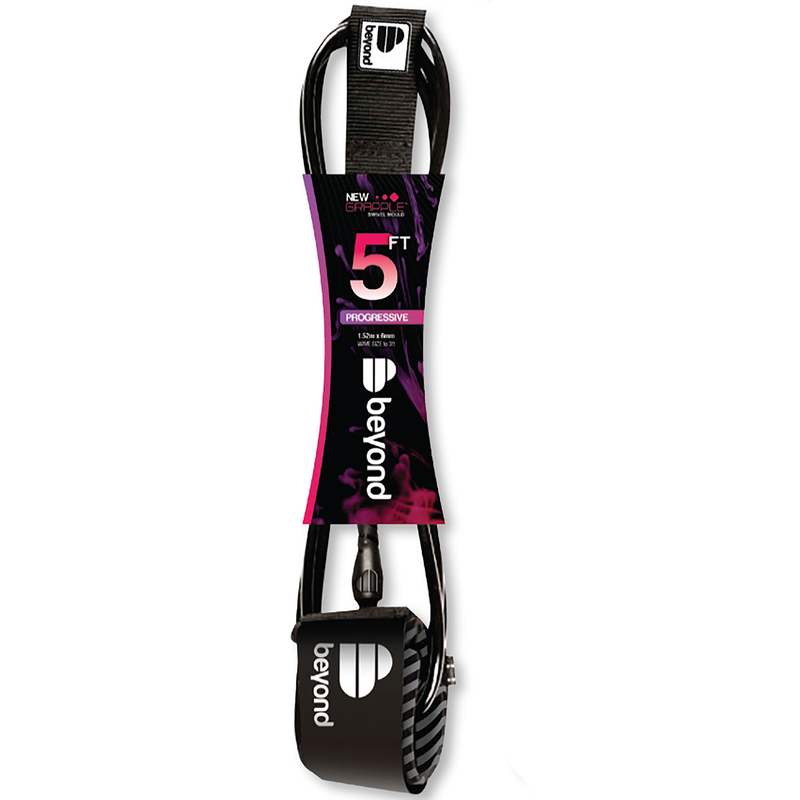 The Beyond 5ft (1.52 m) Progressive Surfboard Leash - engineered for strength. Shop / Surfboards and Accessories / Leashes / Beyond® Surfboard Leash – 5ft progressive. Beyond® Surfboard Leash – 5ft progressive. Total security in a tough, light progressive surfboard leash – The Beyond® 5ft (1.52 m) Progressive Surfboard Leash: * New and unique Grapple TM with swivel mould which distributes stress and flex more effectively * Ultra strengthened lightweight 6 mm urethane cord * High density neoprene ankle strap * Double stainless steel swivels * Quick release safety strap * Internal key pocket * Detachable rail saver. Leash security at its best. The first choice of the Quiver team…..
Total security in a tough, strong progressive surfboard leash – The Beyond® 5ft (1.52 m) Progressive surfboard leash – 40 years of experience and genuine engineering research into comfort, strength and quality in this leash. Total security when you need it. Trust us, we know – these leashes do not break. See our stretch test here…. * New and unique Grapple TM with swivel mould – distributes stress and flex more effectively. * Ultra strengthened 6mm urethane cord. * High density neoprene ankle strap. * Double stainless steel swivels. * Quick release safety strap. Designed for competition use in up to 4 ft surf, this 5′ Progressive Leash is thin and lightweight whilst maintaining its strength. Our leashes feature the engineer designed “Grapple” moulded anti-twist connector, spreading stretch load over greater distances, dialling out areas of weakness and giving you total security where it’s needed most. Scientifically engineered for reduced breakage with the best urethane cord we can buy. Trust when you need it.